Enjoy a peaceful moment in nature. 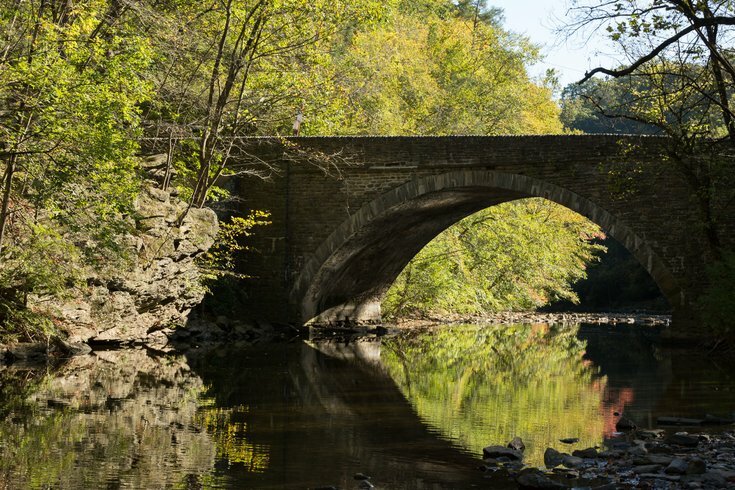 This October 2017 image shows the Valley Green Road crossing over the Wissahickon Creek in Wissahickon Valley Park. The Philadelphia Environmental Film Festival will return for the second year to the Prince Theatre, on the first weekend of April. Some of the films selected celebrate the beauty of nature, while others inform audiences about the challenges facing our planet. "We offer a wide spectrum of topics and a broad range of styles, from straightforward documentaries to artistic explorations," stated Alexandra Drobac Diagne, artistic director for the festival. Tickets are currently on sale. A single ticket is $12 ($5 for students and children). Weekend passes for $35 are also available. Want to attend but not sure what to go see? Below are a few standout films to check out. Synopsis: The Pacific Island nation of Kiribati is one of the most remote places on the planet, seemingly far-removed from the pressures of modern life. This film profiles Anote Tong, former president of Kiribati, in his international fight to have climate displacement recognized as a human rights issue. Synopsis: Half of all marine life has been lost in the last 40 years. By 2050, there will be more plastic in the sea than fish. "Blue" tells the powerful story of our changing oceans, profiling passionate advocates who defend habitats, campaign for smarter fishing, combat marine pollution and fight for protection of keystone species. Synopsis: Coral reefs around the world are vanishing at an unprecedented rate due to manmade climate change. Using time-lapse photography and cinematography, divers, photographers and scientists set out on an ocean adventure to document the heartbreaking losses of coral in the Great Barrier Reef and elsewhere. "Living in the Future's Past"
Synopsis: Academy Award-winner Jeff Bridges presents an original film about who we are and the environmental challenges we face. Along with prominent scientists and authors, Bridges weaves a story that upends our way of thinking and provides insights into our subconscious motivations. Synopsis: Through the eyes of chefs like Anthony Bourdain and Mario Batali, this film aims to change the way people buy, cook and eat food. Synopsis: The world leader in sustainable building materials, 353-year-old French company Saint-Gobain, asks: What’s happening in Philadelphia’s neighborhoods? Who and what is driving this urban and environmental renaissance? Why does it matter? The film turns its lens on key leaders and iconic building projects to understand the unique spirit of the City of Brotherly Love.